Back in 2012, archaeologists concluded that a series of cave paintings in Spain were created by Neanderthals, not early humans as was previously assumed. Critics complained about the dating method used, and more contentiously, claimed that only modern humans had the capacity for symbolic thought. Now, using an updated dating technique, scientists have shown yet again that Neanderthals are the most likely source of the paintings—but will it be enough to finally dispel outdated notions of Neanderthal intelligence? Using uranium-thorium dating, scientists from the University of Southampton, the Max Planck Institute for Evolutionary Anthropology, and other institutions have shown that ancient cave paintings inside three northern Spanish caves were produced no earlier than 64,000 years ago. That’s a full 20,000 years before modern humans arrived in Europe, which means the paintings were most likely made by Neanderthals, whose ancestors, Homo erectus, left Africa around 1.81 million years ago. What’s more, the finding demonstrates, perhaps conclusively this time, that Neanderthals had the capacity for symbolic thought—a cognitive trait once thought exclusive to Homo sapiens. The ability to represent objects outside the mind, this study suggests, was likely passed down to Neanderthals and modern humans from a common ancestor. 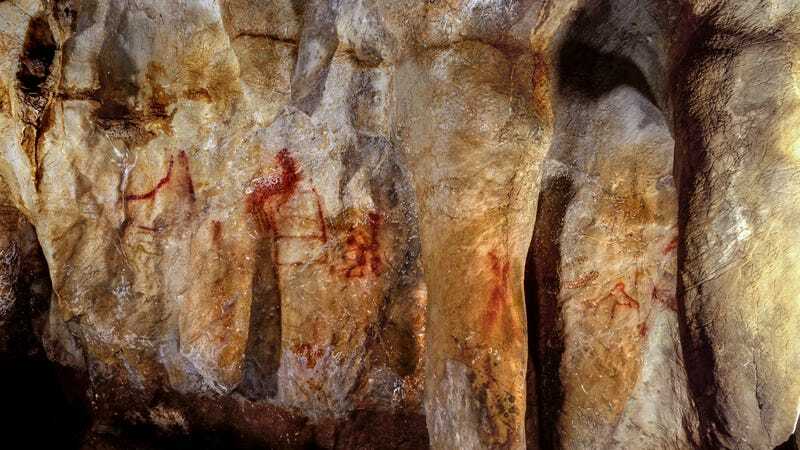 The red and black paintings, which include representations of animals, dots, geometric signs, and hand stencils, are located in three Spanish caves, La Pasiega, Maltravieso, and Ardales, which are 435 miles (700 km) apart. Archaeologists have been studying these paintings for years, but because they couldn’t be accurately dated, many simply assumed that modern humans must have been responsible for their decoration. Neanderthals, it’s been long held, weren’t sophisticated thinkers, and they lacked the ability for abstract thought. And in fact, a study came out just two weeks ago claiming that Homo sapiens prevailed in Eurasia because Neanderthals couldn’t draw. The new study, published today in Science, shows that Neanderthals were very much capable of producing cave art, and by consequence had the capacity for symbolic behavior. The lack of consensus around the origin date has a lot to do with the limits of the technique traditionally used to date rock art: radiocarbon dating. Indeed, the uranium-thorium dating of isotope samples is considered very reliable, and it can be used to determine the age of calcium carbonate formations up to a half million years old. In this case, the archaeologists analyzed red ochre carbonite, consisting of 60 different samples of less than 10 milligrams each, to reach minimum ages of between 64,000 to 66,000 years for the art. A 1913 drawing of Panel 78 in La Pasiega. The red scalariform, or ladder symbol, is at least 64,000 years old, but it’s not known if the animals and other symbols were painted later. “Our results show that the paintings we dated are, by far, the oldest known cave art in the world, and were created at least 20,000 years before modern humans arrived in Europe from Africa—therefore they must have been painted by Neanderthals,” said study co-lead author and University of Southampton archaeologist Chris Standish in a statement. Now, it’s theoretically possible that modern humans were in the area around this time—theoretically being the key word. Our species, Homo sapiens, emerged 300,000 years ago and they entered into what is now the Middle East between 175,000 to 200,000 years ago. But there’s no archaeological or paleontological evidence to support the presence of modern humans in Europe prior to 44,000 years ago, as Standish points out. By contrast, we know that Neanderthals were all over Europe during this period of pre-history. But like previous efforts to pin the art to Neanderthals, there’s bound to be a backlash. That Neanderthals were capable of producing this art should not come as a surprise. If anything, this new study is actually quite underwhelming in terms of what it’s telling us about Neanderthals and what they were capable of.